Guthrie's building spree peaked April 9, 1902, with laying the corner-stone for its commodious City Hall, designed by Joseph Foucart in his best belfry and turret style. The building's second floor assembly room was used for the Constitutional Convention beginning November 1906, as elected delegates hammered out Oklahoma's State Constitution. 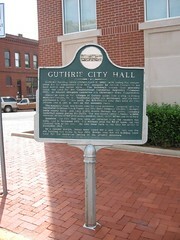 Almost as soon as the villages of Guthrie united into a city, a fitting municipal building for the Territorial Capital was envisioned, and lots were purchased in 1891. When built, the $25,000.00 City Hall held all city offices and a jail as well as the assembly room. The assembly room was freely used for civic purposes inaugural balls for Territorial Governor Frank Frank Frantz and first State Governor Charles V. Haskell; early county fairs; and many public events through the years, including basketball games during the 1920's. Use was denied Carry A. Nation in 1906, however, on one of her prohibition speaking tours, to her bitter and vocal fury. Somehow, the City Hall lots were not removed from the county's tax rolls, and in November 1912, R. L. Williams paid the $7.45 taxes due and received title to the lots. He sold them back to the City for $8.00 in December 1915. By a slender margin, bonds were voted for a new City Hall and the old building was razed in July 1955. Bricks from the old building were used for the entryway paving of the present structure.